Spring 2005. 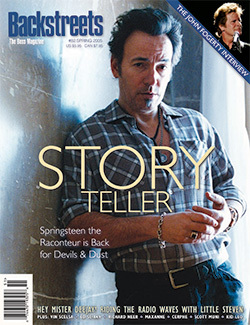 “Story Teller.” With the release of Devils & Dust, Springsteen gets back to his one-man Troubadour mode, and our coverage starts here with an early look at the album and tour, including coverage of the VH1 Storytellers performance from Eric Alterman and Christopher Phillips. As promised last time, we present The Backstreets Interview with John Fogerty, an exclusive sit-down with the father of the flannel shirt, with in-depth chat and rare photos following Fogerty from his days with CCR through his new album and the Vote for Change tour with Springsteen and the E Street Band; sidebars run down all of the Fogerty covers that Bruce has performed over the years, plus his Hall of Fame induction speech of Fogerty in 1993. In Hey Mr. Deejay, we pay tribute to the radio greats who helped take Springtseen to the top in the ‘70s, interviewing a whole host of “Boss Jocks” including Ed Sciaky, Vin Scelsa, Richard Neer, Maxanne, Cerphe, Scott Muni and Kid Leo. And we wrap it all up with another exclusive interview, visiting the Underground Garage with Little Steven. Plus: the 2005 RCDS show; Springsteen inducts U2 into the Rock and Roll Hall of Fame (with full speech transcription); new and upcoming Bruce books, featuring an interview with author Tennessee Jones; the “Anytown” dance performance set to the music of Springsteen, Scialfa, and Tyrell; and our usual columns and Boss news including reviews of the latest CD-Rs and Bruce boots. 56 pages, all in glorious full color.